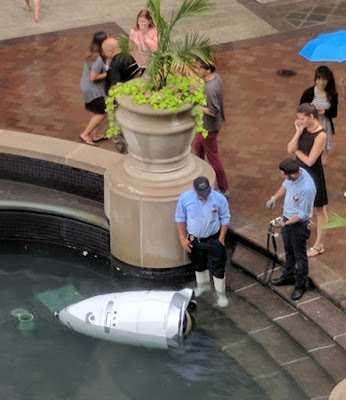 Until the autopsy results come in, we can only guess why Steve the Security Robot drowned this week in Washington, DC. May he Rust in Peace. Automation—including marketing automation—is only as good as the weakest link in the process. The weak link in marketing automation is content. Marketers go to all lengths to create pretty logos, websites, blogs, banner ads, brochures and tradeshow booths, but allow marketing automation to sully their brands. Annoy prospects. They program Mark to assume a form-fill means the prospect welcomes one or two cloying emails every single day for 20 days. Trust me, she doesn't. Confuse prospects. They program him to send long-winded, self-absorbed emails that spew largely irrelevant product features. They never bother to communicate a core—or convincing—value proposition; only a lot of sales-talk. Offend prospects. They program Mark to send emails with click-bait Subject lines, unproven or exaggerated claims, typos, grammatical errors, and pointless and presumptive closes. It's no wonder so many CMOs struggle with marketing automation.